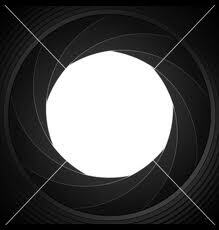 The "I" thought is the shutter that closes over the Light and blinds one from True Seeing. When beginning to investigate who one is, there seems to be periods of time where there is Knowing (or Awareness of who one is) and then not knowing. There will be an opening and an obviousness that there is no individual "I." And then it seems to disappear and the "I" seems real again. One can picture in the mind a shutter... like on a camera or the phones, they have an image of a lens opening taking a picture and then closing. A mechanical device that limits the passage of light. There is a lens (we can call it the "I" thought) and when it is in full use it is like having a closed shutter on a camera; it hides the light (it does not change or alter the Light, it only hides it). Self-investigation is the opening of the lens and Light shines forth (though sometimes the lens completely opens with no attempt to do the opening, but that is rare). The more one investigates who one is, the less there is of them, and the more the Light shines through.